All the focus in the world won’t help you if you don’t know what you’re supposed to be focused on, right? That’s where the old to-do list comes in. When I first started my blog / business, I had lists on scraps of paper everywhere. It was nuts. There was little method to my madness- if I made a list, who knew if I’d ever find it again. Since then, my to-do list has gone through a few distinct iterations- each good for different needs. I thought it would be fun to look back on different set ups I used and share why I went to the method I use now. 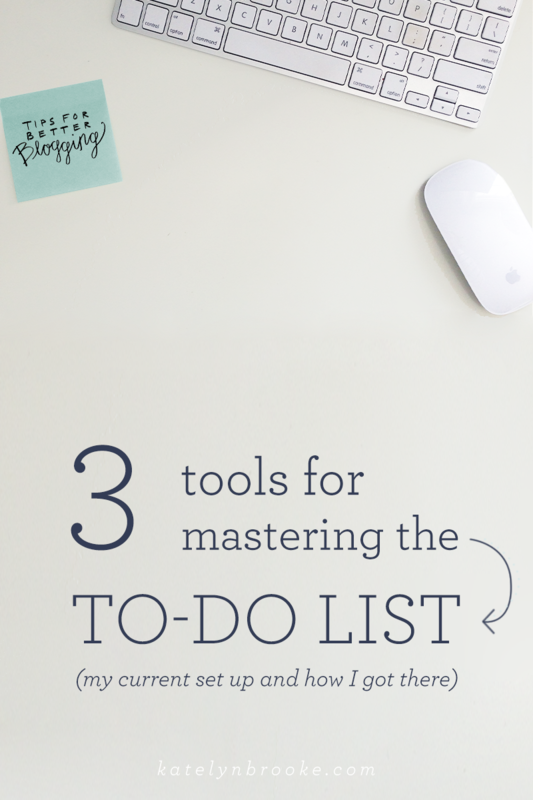 This site / app was all the rage when I signed up in 2012, and it was the first step towards getting all of my tasks in one place. The app is super simple, featuring a single list for each day. The interface is really beautifully designed, and you can get the app for your phone to be able to see everything in one place. It’s great if you don’t need to categorize you to-do items. As my business grew and I started to take on more client projects, I needed a way to list out the steps for the different projects and keep them separated, yet all in the same place. Honestly, this tool was really hard to give up. It just happened that I incorporated two other tools into my system for other reasons, making this one obsolete for me. I’ve settled into a routine for almost a year now with my current set up, and I’m really happy with it. I got Basecamp because my email was busting at the seams and the idea of a platform that could contain all of my client communication really appealed to me. I know that now there are a ton of different platforms out there that do the same thing and are probably even designed better or are less expensive. But at the time, I just needed a solution, and this is the one I kept hearing about over and over and I have to say that it has delivered for me. I use Basecamp for all my client communication and all my client project to-do items. I use the private to-do lists and the calendar to organize all my client work. I know where work lives, and it doesn’t get entangled with my personal stuff or any other business / blogging related tasks. Basecamp also has awesome iPad and iPhone apps now, which makes accessing work on the go super easy- way better than it used to be when my client communication was buried in my inbox. For everything else, I use my Day Designer. I love how there’s a long to-do list to dump all the tasks into, and then a place to pick the top 3 things that need to be accomplished that day. Since all the individual work tasks are on Basecamp, all I do is list the client names that need to be addressed that day, and check them off when all the tasks are complete. I recently wrote about how I even use my Day Designer to track my time. But my favorite thing about it? For me, there’s something invaluable about putting pencil to paper. It makes a huge difference. Okay, fine- I guess that was really 4 tools. So now you know how I balance work, personal, and blogging to-dos, and the pull from synced electronic systems with pencil & paper. What system do you use for your to-do lists? P.S. Want to go behind the scenes of how I run my business and learn more about how I manage my client projects? Sign up for In Retrospect, this is the last week to register! I’m all about to do lists. I can’t wait to try these apps out and I’ve heard great things about the Day Designer. Yeah, I love it- and they came out with a bunch of new patterns this year, my 2015 version is navy gingham! I’m super excited about it. I use Any.Do for my task list. It’s simple and clean and just enough for the little I have going on in my life, haha. But I have been wanting to get the Day Designer. It’s beautiful and I love the different covers you can choose from. Especially, since I’m wanting to take my blog to the next level and turn it into a journal with accompanying print editions. I have a long way to go to get there, though. That’s cool, I’ve never heard of that one before- looks nice! Love your goals, Wren! I’ve followed a similar path — TeuxDeux to Todoist… and now I’m kind of in between Todosit and paper. I think I might need to get myself a Day Designer… scrap pieces of paper aren’t working anymore! Yeah, I found that when I was in between systems that that’s when things slipped through the cracks. Sometimes I still whip out a piece of paper for a brain dump, but I like having the Day Designer to house everything more permanently! I’m always up for reviewing, testing, trying new apps. And so funny – my evolution is very similar! Started with and loved TeuxDeux; graduated to Todoist and now integrate the business version of Todoist for managing tasks. When a new project starts we break out the scope of work into a task list on Todoist and sync it up with a client’s folders on Dropbox & Google Drive (for adding their assets). We use InVision for wire-framing through development. I tried both Siasto and Basecamp, but inevitably clients would never log in nor use the apps. Since I was already paying for business versions of both Dropbox and Google Apps AND clients were comfortable working in these environments I opted to meet clients where they are and with tools they like to use. It works well for our team and clients, which as you point out, is the most important part of it all. No paper or daybook. I like my apps and notes in digital form best! I’m also keeping an eye on Cushion for next year (http://cushionapp.com/) for tracking and project management. That’s awesome, I love hearing about other designers’ systems! Do you communicate with the client through email then, or do you use Todoist for that as well? I thought I remembered hearing that they had some kind of interface for that, but maybe I made that up. Wow, cushion looks amazing! Right now I have a spreadsheet that I use for that (I actually got the idea from Zoe Rooney and she recently put it in a blog post) But it sounds like that app does way more than my spreadsheet, haha! We do primarily communicate via email for projects. For every service area we use checklists and since so many of our clients are motivated, entrepreneurial types they love being able to follow along week by week and see their checklist tasks and work on them as we go. For feedback we have guide documents for our brand process to help elicit constructive feedback. And of course, we’re happy to schedule quick phone calls if needed. Yeah! I’m excited to check out Cushion as it develops! Right now it’s me and spreadsheets and my accountant, too! One other tool (although it not digital) that I recommend is Bullet Journal! This keeps me organized so much and I really want everyone to try it at least once! I like that- looks really cool! Thanks for sharing, Aina! you saw my current state of organization on instagram :) now if i could stop opening SO many tabs in my browser of things I want to read “later” ;) thank you!! Haha that’s the dream, right? I have a hard time with that myself! I don’t know if it would be helpful for you, Jenn, but I use Pocket (which has a lovely Chrome extension) to save and label my “read later” finds. About ReadLater, i have the same problem, and found i set upp a bookmarkfolder, called ReadLater, and save stuff here. Love Basecamp and am going to have to look into the Day Designer. I am new to blogging and I really appreciate the insight. As I am sure you did when you started out, it is still all a lot of trial and error. Thanks for the organizational tips. I would really like to turn my blog into something lucrative, but I have a full time job on top of these efforts. I will have to give these a try! Great post! Task management is an ongoing process of planning, preparation and readjustment of time, there will never be a time when we get it perfect. I’d like to recommend ProofHub ( http://www.proofhub.com/ ) here. I use it to manage my projects, college tasks and my craft shop. It helps me to be organized, to check the work of interns, send reports and assign tasks to my marketing team. I can easily see which tasks are done and which ones are due.